One of the most common questions people ask me is how to stay motivated. Getting motivated is the easy part. It is much more difficult to to stay motivated. If you want some evidence, walk into any health club in January. Then, go back to that same club on the same day and time in February. There will be fewer people working out in the second month of the year. Many people will have unfortunately given up on their resolutions by that point. There are a number of reasons why people give up on goals that they were once excited and motivated to pursue. One of the most common reasons is a lack of perceived progress. Whether or not you are actually making progress is not as important as whether you feel like you are. In this article, you’ll learn a proven strategy to feel like you are making progress and to stay motivated for anything that you choose to pursue. Note: If this is your first time at StrongerHabits.com, you can click here to take a free assessment that measures your current habits in four key areas. The assessment takes less than 3 minutes, and you get your results immediately. You’ll also get 3 free videos (sent to you over the next week) on how to break bad habits and make good ones last. When my brother Matt and I were teenagers, we had part-time jobs as caddies at a local country club in our hometown. On days that we worked, we arrived at the golf course around 6:00 a.m., and we waited to be assigned to our golfers for the day. Then, we walked the eighteen-hole course for about four hours. During each round, we carried a golf bag on each shoulder (about fifty pounds of weight in total). I hated this job and worked inconsistently for two summers. (We did not have a fixed schedule, so we could show up as much or as little as we wanted.) Matt, on the other hand, worked religiously during summers and holiday breaks for nearly a decade. One summer, he even caddied on thirty-nine straight days, en route to earning more than $13,000 in cash in less than four months. How many teenagers make that kind of money legally? There is a key reason why Matt and I had such different experiences, and it has nothing to do with willpower or discipline. Matt set financial goals for himself and he tracked his progress. Whenever he got home from another day at the golf course, he updated a spreadsheet that he had created to monitor his earnings. Each day, he could see and feel his progress. In comparison, I did not have any financial goals or a system to measure my progress/earnings. As a result, caddying felt like pointless torture to me, my motivation plummeted, and my attendance and performance suffered. Other research has led to additional insights on how to maximize the impact and motivational benefits of tracking. According to a concept known as the small-area hypothesis, motivation increases (for goals that you want to complete) when you focus your attention on whatever is smaller in size between (a) how far you have come and (b) how far you have to go. When you are getting started, track accumulated progress. Focus on what you have achieved so far, instead of how far you have to go, which would be de-motivating. Once you are at least half-way to a goal that you want to complete, track remaining progress and focus on how close you are to your target. 2 Figure 1 provides a visual depiction of tracking yourself this way, which I refer to as the count up, count down approach. Figure 1. A visual depiction of the count up, count down approach. Focus on accumulated progress until you are 50% to your goal. Then, focus on remaining progress until you are 100% to your goal. 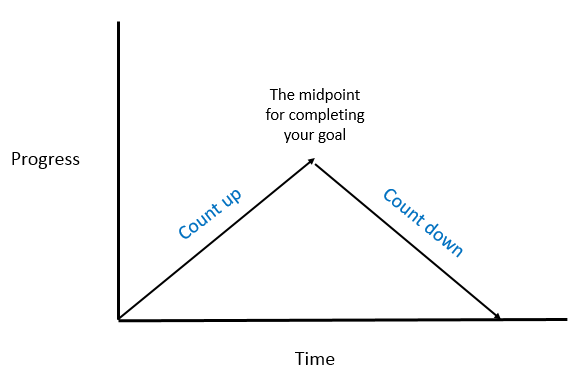 The count up, count down approach is best for goals or projects that (a) have a clear endpoint and (b) you want to finish. Examples might include losing a certain amount of weight, completing a tedious assignment at work, or cleaning out your garage. If you have a goal, project, hobby, etc. that you wish to pursue but not finish, you are more likely to stay motivated by focusing strictly on accumulated progress. Figure 2 provides a visual depiction of tracking yourself this way, which I refer to as the just count up approach. Figure 2. A visual depiction of the just count up approach. Focus strictly on accumulated progress. As an example, I “just count up” when tracking my progress with my writing. Each time that I write a new article, my content archive and total word count grows. I track this in a simple spreadsheet. It’s extremely motivating to me. My content archive is like a bank account that gets bigger each week. Each week, I generate new content and accumulate more progress. My motivation to write would be less consistent if I didn’t track my writing progress at all, or if I started counting down at some point to a final word count. Writing is not something that I want to end. It’s something that I want to pursue for as long as possible. The count up, count down approach: When you have a clear goal or project that you want to finish, count up until you are at halfway to your goal. Then, count down until you finish. 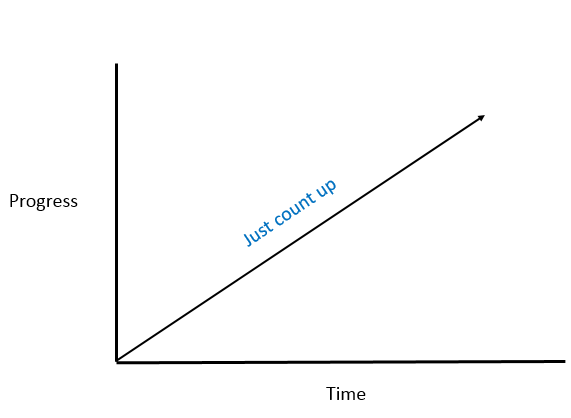 The just count up approach: When you have a more abstract goal or project (or something that you do not want to finish), just count up. Few people truly leverage the power of tracking progress. Identify at least one area of your life where you could start tracking your progress today. It will be worth it. “Frequently Monitoring Progress Toward Goals Increases Chance of Success,” American Psychological Association, October 28, 2015, http://www.apa.org/news/press/releases/2015/10/progress-goals.aspx. Minjung Koo and Ayelet Fishbach, “The Small-Area Hypothesis: Effects of Progress Monitoring on Goal Adherence,” Journal of Consumer Research, Vol. 39, No. 3 (October 2012), pp. 493-509.